This volume contains a collection of relevant information for drug discovery in cell cycle research. Protocols to develop screening assays or to identify novel CDK inhibitors are discussed in the first part of the book. 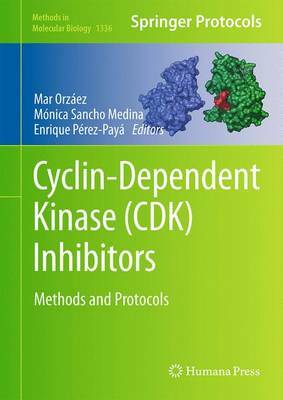 The second part of the book describes elaborate procedures to evaluate activity and mechanism of action of new and already identified CDK inhibitors. The third part of the book talks about protocols to evaluate metabolomics changes associated to inhibitor treatment. Drug delivery strategies focused on nanoparticle development to provide alternative internalization systems for increasing inhibitor efficacy are also described. Written in the highly successful Methods in Molecular Biology series format, chapters include introductions to their respective topics, lists of the necessary materials and reagents, step-by-step, readily reproducible laboratory protocols, and tips on troubleshooting and avoiding known pitfalls. Authoritative and thorough, Cyclin-Dependent Kinase (CDK) Inhibitors: Methods and Protocols is a useful tool for scientists interested in this research field.